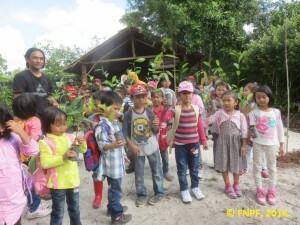 Conservation education has been one of the main programs of FNPF Kalimantan. For several years, we have worked closely with students from elementary to high school nearby to our working sites. Recently, we expanded our target for conservation education to include early childhood and have begun working with 3 kindergartens in Kumai for the last couple of months. Most recently we worked with kindergartens TK Bhayangkari I, II and III. The conservation education progam was held over three days from April 28th-30th, 2016. On the 28th of April, we had 76 kindergarten participants. The next day there were 60 children and on the last day there were 50 les enfants. 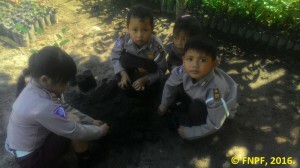 They were also accompanied by their teachers and several parents also joined the activities. 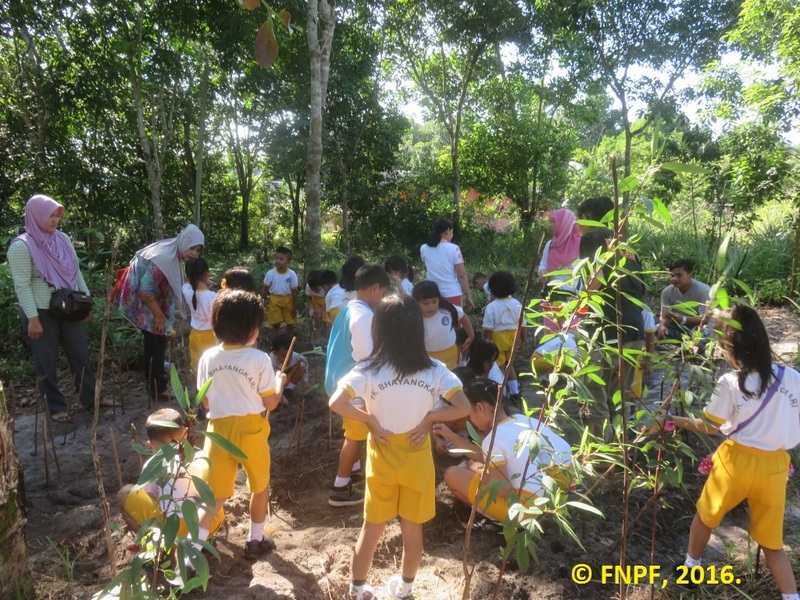 The early childhood conservation program is designed to be fun and different from their regular education in elementary, middle or high school. In our program, children learn about many kinds of fruit trees they often see in their daily life. They also learned how to plant cassava and kencur, and to harvest ginger. Children learned to fill the polybags with soil and how to plant seeds inside of the polybags. They also learned about livestock such as chicken and fish and how to feed them. We concluded the activity day by making Rosella tea (which they also brought home with them) and each child were given one fruit tree for them to plant at home. Early childhood is an important stage in building character the character of a person and we hope to create a new generation of Indonesian youth who are aware of the importance of conservation. We would like to thank our donor, Rettet den Regenwald (Rainforest Rescue) for helping us making this project possible.